Conservationists are lobbying for the inclusion of the cheetah on the international list of endangered species. A new study by Zoological Society of London (ZSL), Panthera Corporation of London, which works on reducing threats to wild cats, and Wildlife Conservation Society (WCS) of New York, shows cheetahs are on the verge of extinction, with 7,100 remaining globally. This figure represents a more than 90 per cent drop from 100 years ago. ZSL, Panthera, and WCS want the wild cheetah put on the International Union for the Conservation of Nature’s list of endangered species to avert the impending extinction of the mammal. The organisations say urgent landscape-wide conservation action is needed to reverse the decline. They cite the Asiatic cheetah populations which have been hit hard, with fewer than 50 individuals remaining in one isolated pocket of Iran. The rest of the world’s cheetahs in Africa are restricted to only 13 per cent of their historical distributional range. They live on unprotected land and face increased pressures from widespread human–wildlife conflict. 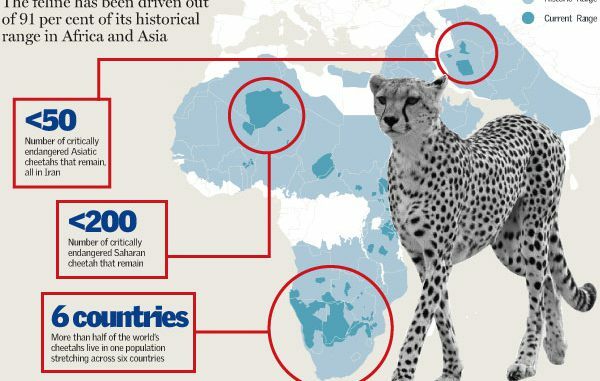 Data shows that there are still 2,290 cheetahs in East Africa, with 1,362 moving between Kenya and Tanzania; Ethiopia and South Sudan host some. ZSL researcher Sarah Durant said cheetahs are a challenging species to conserve as they move widely to find prey while avoiding large predators like the lion and spotted hyena, which may kill their cubs and steal their kills. “Given the secretive nature of this elusive cat, it has been difficult to gather hard information on the species, leading to its plight being overlooked,” said Dr Durant. Cheetahs can travel over 1,000 square kilometres every year. They have been driven out of 91 per cent of their historic range by changes in land tenure as the protected area systems are insufficient for long-term survival, with most of the animals living outside protected areas. They face multiple threats including loss of habitat and prey, conflict with livestock and game keepers, illegal wildlife trade in live cheetahs for pets and dead ones for skins, political instability and large scale fencing. Unrestricted by boundaries, the species’ wide-ranging movement weakens protection. For example, Zimbabwe’s cheetah population has declined from 1,200 to 170 animals in 16 years, representing a loss of 85 per cent. Researchers are calling for the co-ordination of regional conservation efforts between countries where cheetahs still roam. They also suggest including incentives for the local population to conserve the cats. Panthera’s Cheetah Programme director Dr Kim Young-Overton said the latest study is a wake-up call showing how close cheetahs are to extinction, saying securing protected areas alone is not enough. “We must think bigger, conserving across the mosaic of protected and unprotected landscapes that these far-ranging cats inhabit, if we are to avert the otherwise certain loss of the cheetah forever,” he said. Communities that share their land with cheetahs cannot afford to pay the costs of losing their precious livestock to cheetah, he said. Panthera Corporation, WCS and ZSL have documented densities as low as only one cheetah per 4,000 square kilometres in the Sahara, where the endangered cat still survives. “Our findings show that given the large space requirements for cheetahs, coupled with a complex range of threats faced, species in the wild are likely to be much more vulnerable to extinction than was previously thought,” said Durant. She said governments and cheetah conservation communities had put in place comprehensive frameworks for action to save the species, but resources are needed to implement innovative new ways for communities to benefit from the presence of wildlife. For the cheetah, there is an urgent need to find political will and financial means to enable people and wildlife coexist, she said. West, Central and North Africa have about 457 cheetahs with 238 moving between the Central African Republic and Chad; 191 between Algeria and Mali while 25 roam from Benin to Burkina Faso and Niger. Southern Africa has the highest number of cheetahs, with 4,297 surviving. It is estimated that there are 4,021 cheetahs are in Angola, Botswana, Mozambique, South Africa, Namibia and Zambia.